Kissing bugs are not new insects to California or the United States, but there has been a good deal of press about them in recent years because conenose bugs can vector a protozoan, Trypanosoma cruzi, that causes Chagas disease in humans. While conenose bugs do bite humans, the protozoan is transmitted via the bug's feces, rather than through bites. However, cases of Chagas disease infections is still rare in the U.S., and especially rare in California. Conenose bugs prefer sheltered habitat such as indoors, beneath porches, in wood or brush piles, and in outdoor structures such as dog houses and chicken coops. They are generally active at night and are attracted to white lights. 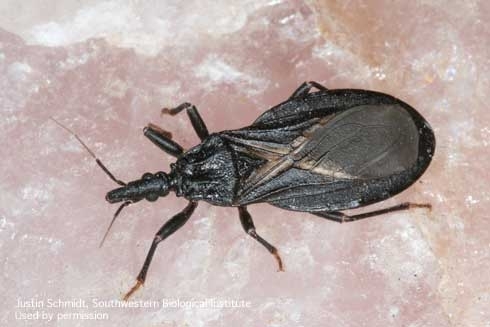 For information about kissing bugs and ways to keep them out of your house, visit UC IPM's Pests Notes: Conenose Bugs. You may also be interested in the Centers for Disease Control and Prevention website which has more information about these bugs, photos and information to help in identification, and solutions to keep them out of your home. If you suspect you've encountered a conenose bug in your home or landscape, do not touch the bug with bare hands. Collect the specimen in a sealed container or take a picture and send it to your local UC Cooperative Extension office, UC Master Gardeners, or county agricultural commissioner for identification.